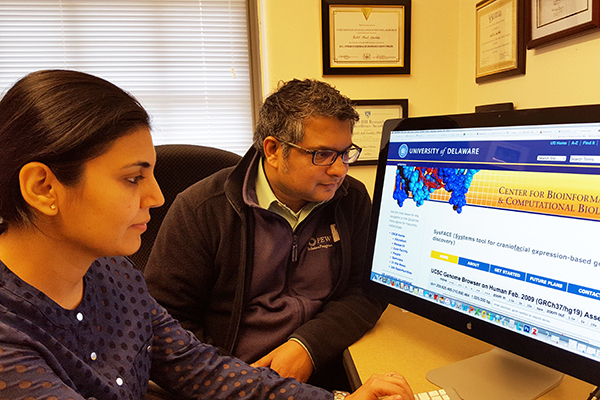 Deepti Anand (left) and Salil Lachke work with the new tool they are developing to help in the hunt for genes related to orofacial cleft birth defects. Nov. 23, 2015–It’s nothing like Facebook, but FaceBase is another growing network chock full of information about humans and other organisms – a mostly open-access database of genetic traits and characteristics that researchers and others in the scientific community can use to address perplexing dental and craniofacial problems with greater efficiency. University of Delaware biologist Salil Lachke is in the middle of that grand collaboration, drawing on a $474,500 grant from the National Institutes of Health to help identify the culprits behind certain birth defects and find ways to address them. The FaceBase project is administered by the National Institute of Dental and Craniofacial Research. Lachke, a 2012 Pew Scholar in the Biomedical Sciences and assistant professor of biological sciences at UD, specializes in developmental biology, cell biology and genetics. In this project, he is using UD’s bioinformatics tools to build a curated genomic reference library to identify genes that are potentially linked to a common type of birth defect known as orofacial clefting, a disorder that disrupts proper formation of the face and mouth. In the amazing construction project that is the making of a human being, “a whole lot of things can go wrong,” Lachke said. For example, a baby’s face develops by way of specialized tissues that grow from each side of the head toward the middle. When these processes are defective, they lead to orofacial clefting, a malformation that occurs because of a gap in part of the face or the oral cavity, including the lip or palate. Orofacial clefting can occur for a variety of reasons, and increased risk may include a combination of factors such as genetic alterations in the baby, conditions present in the mother during pregnancy such as diabetes, use of certain medications or smoking, Lachke said. Depending on the area of the world, it appears in one of every 400-1,000 live births. It is important to identify the genetic factors associated with this common birth defect. “It is not easy to identify the genes associated with clefting,” he said. “Now, because of 21st century technology, we can use a very powerful sequencing approach – called exome sequencing – to identify changes in the DNA of patients with developmental defects such as orofacial clefts. In short, how does one prioritize candidate genes from this wealth of information? Part of the answer lies in learning which genes are being expressed while the face is being formed. That means exploring the 22,000 protein-coding genes in the human genome and seeing which proteins are at work in the development process. Proteins are essential to many biological functions and have much to do with how genes do their jobs, turning some traits on and some traits off at specific times. Lachke’s library of genes with “enriched” expression in craniofacial tissue development – called SysFACE (Systems tool for craniofacial expression-based gene discovery) – will be hosted at the University’s Center for Bioinformatics and Computational Biology. Collaborating with Lachke in the work is Irfan Saadi of the University of Kansas Medical Center, an expert in neural crest cells that contribute to the formation of the face. Already, the new database – in beta form – has helped Azeez Butali of the University of Iowa’s Department of Oral Pathology, Radiology and Medicine prioritize the correct mutant gene from a number of variants in a case of inherited cleft palate that affected eight members of a family, Lachke said. One member of Lachke’s lab, postdoc Deepti Anand, presented details of the project and its significance in the Iowa case at the 38th annual meeting of the Society for Craniofacial Genetics and Developmental Biology held last month at Johns Hopkins University. “SysFACE was very well received by the research community, and we have already initiated several new collaborations to identify genes linked to inherited cases of orofacial clefting in families,” Anand said. Lachke’s lab already is known for its work on cataracts and other eye disorders, using his iSyTE bioinformatics tool (integrated Systems Tool for Eye gene discovery), which has revealed several new genes associated with eye disease. “Now SysFACE is poised to make a splash in craniofacial disorders,” he said.